Welcome to the exciting profession of law, which will challenge you to the hilt but then will let you fly high with the sky as the limit. An LLB course and legal profession is the one with unlimited scopes and ever-expanding horizons. It is not only one of the oldest professions known to the world but also one of such professions, which continuously re-invents itself. In the current era of liberalization and globalization, it has diversified and percolated to new realms hitherto unheard of. Though India currently boasts of more than 5,00,000 lawyers and the legal fraternity is continuing to grow with more than 15,000 fresh LLB graduates joining the profession every year, demand for good lawyers who can really deliver in a menacingly competitive field continues unabated. Let me put in a nutshell the multifarious options available for a young law graduate. The Anglo-Saxon system as imbibed by our system follows an adversarial system of trial. Herein two advocates representing their parties’ case or position are pitted against each other arguing before an impartial person or group of people, usually a jury or judge, who attempt to determine the truth and pass judgment accordingly. Thus litigation processing and management are what a law professional is primarily trained for in law schools. It obviously follows that the first career choice for a fresh graduate after obtaining a degree in law is to practice law as an advocate or lawyer. The Bar Council of India is the professional body regulating the profession in India and respective State Bar Councils enrols graduates holding a law degree from an approved institution into its rolls. Besides, he/she is also required to qualify for the entry test (AIBE) recently introduced by Bar Council of India failing which the candidate is disentitled to practice. Court practice is challenging and extremely competitive.Perseverance and relentless hard work coupled with an array of skill-set including analytical aptitude, logical reasoning, interpersonal skills and above all a passion for the profession can definitely take you the higher echelons of the profession. The conventional realm of civil and criminal practice, even while continuing to be a significant part of lawyers job, is fast getting obliterated by new avenues of litigation thrown up by the transformation of the Indian economy, post-1990’s. The array of opportunities opened up by liberalization and globalization for a litigation lawyer is simply phenomenal. After the liberalization of India’s economy, there is a huge demand for highly skilled lawyers who are adept in the corporate affairs, mergers and acquisitions, banking and finance, infrastructure contracts, debt restructuring, FEMA regulations, IPRs, International trade and taxation law etc. Non-litigating Lawyers can work as legal counsel and legal advisors for corporate sector firms and MNCs. Furthermore, the recent switch over to the revolutionary GST system is sure to open up exciting new avenues for taxation lawyers. Recently there has been a call for a paradigm shift from conventional adversarial system to Alternate Dispute Resolution methods including arbitration, conciliation, mediation and negotiation procedure primarily fomented by a huge backlog of cases and issues of access to justice. This paradigm change has created a demand for lawyers trained in ADR methods especially in private and business disputes. Government being the manifestation of State should be more concerned about legal compliance than a private entity as its actions may impinge upon the rights of citizens and are subject to intense judicial scrutiny. Legal and constitutional compliance of Governmental actions becomes more important in a Constitutional democracy envisaging a federal polity as the written constitution itself demarcates the space in which governments, both federal and State can manoeuvre. This mandates the creation of dedicated legal departments in Governments for dispensing of legal advice to other departments as well as crosschecking governmental actions at the touchstone of the constitution. Law graduates are recruited for Indian legal service against various posts– Legal advisors in Department of Legal Affairs and Legislative Counsel in Legislative Department. Legislative Counsels are also appointed in official languages Wing of the Legislative Department for Hindi and Regional languages. Law officers/ Legal advisors are also appointed in almost all the ministries/departments/ undertakings of the Govt. of India. Similar posts occur at the State level also opening up a secure and well-paid career option for law graduates. UPSC and State PSC’s usually oversee the recruitment process to these posts. The elevation in ranks is pretty fast in Governmental legal departments compared to other departments and an entry-level non-gazetted legal assistant/legal/judicial translator can aspire to be elevated to the rank of secretary to the Government at the zenith of his career. Lawyers with practical experience are also appointed to represent the government in courts, as leaders and public prosecutors where State impleads are one of the parties. The Directorate of Public Prosecution with a hierarchy of lawyers starting from the assistant public prosecutor and helmed by the Director General of Prosecutions handles all criminal cases. The upper echelons of this hierarchy are usually political appointments whereas the lower rungs including the entry-level post of Assistant Public Prosecutors are increasingly being filled in many States in a competitive manner by Public Service Commissions with good prospects for promotion. Other posts such as Public Prosecutors, Attorney General, Advocate General, legal secretaries in legislative assemblies are also open to law professionals, however, vast experience and a certain level of political commitment are required to hold these positions. If you are a young LLB degree holder and of sterner stuff in pursuit of a more adventurous career, you can try a hand as a commissioned officer in the armed forces. The Judge Advocate General (JAG) branch of Armed forces offers exciting opportunities to young lawyers to work in challenging environments with attractive pay packages. Basically, professionals manning the branch will be called upon to assist in the conduct of Courts of Enquiry and Court Martial proceedings of service personnel found to be breaching the strictures of armed forces. Moreover, the branch keeps a close tab on developments in International Law of War and Human Rights and sees that actions of armed forces are in maximum compliance with those. With good prospects of elevation to higher ranks including that of Brigadier General, this is definitely a career option to be kept in reckoning by smart budding lawyers. The most sought-after and respected career option for a law professional is perhaps the entry into the echelons of judicial hierarchy as a judicial officer. Though the basic qualification for holding any judicial post is a bachelor degree in law with a certain amount of practice, if you are striving for a coveted seat of a member of higher judiciary it calls for much more than that. In the Judiciary, the lowest judicial cadre posts of Magistrate/Munsif of the first class are filled up by recruitment through public service commissions or otherwise under the supervision of the High Court. They, then progressively raises to the rank of a sub-judge and then the district and sessions judge over a period of time. Meritorious candidates even get elevated to higher judiciary. Earlier District and Sessions Judges were promoted from those in service but now they are being increasingly being recruited through competitive examination conducted by State commissions / High Courts. We have a collegium system in place for the appointment of judges of the higher judiciary including High Court and Supreme Court. Only senior lawyers of exceptional merit and longstanding illustrious career can aspire to be appointed as judges of higher judiciary. There has been a meteorological rise in salary and perks of judicial officers including those belonging to the lower rungs making this indeed one of the best career options available to a law graduate. Young LLB graduates having a pungent for teaching and research can have a fulfilling career in Academics after getting a post graduation in law. They may find placements as Assistant Professors in various the best law schools, Government law colleges and private universities imparting law courses. However, progressing through an academic career calls for dedication and hard work since an aspiring academician may have to invest significant effort and time to cross such milestones as qualifying the National Eligibility Test for Lectureship (NET) conducted by UGC and then acquiring a PhD degree in law. With the 7th pay commission pay in anvil duly qualified legal academicians can expect very handsome pay packages comparable to senior civil servants to the government. There is also scope for lawyers to teach as visiting professors at all institutions imparting legal education prefer practising lawyers of eminence to impart procedural aspects of the law to their students. Legal Resource Sites offer an alternate career for academic lawyers with a flair for research and excellent writing skills. On the legal research front, Lexis Nexis and Manupatra provide great opportunities to candidates interested in legal research. Legal outsourcing, also known as legal process outsourcing (LPO), refers to the practice of a law firm or corporation obtaining legal support services from an outside law firm or legal support services company (LPO provider). More and more foreign firms from the US and other developed countries are eyeing India as a preferred destination for outsourcing legal services, given the similarity of legal systems and language proficiency of Indian professionals. According to a report, India has huge potential in legal outsourcing, with the number of jobs in the field increasing to 79,000 by 2015. An initial stigma that was attached to this kind of jobs are now things of past as the sector has become more remunerative and flexible. However, concerns about data security, issues of privacy and conflict of interest rules are posing certain challenges to the growth of the sector, which we may get resolved once the sector acquires maturity. The burgeoning banking and insurance sector have created a huge demand for banking professionals specialized in law. Moreover, many law graduates are getting inducted as probationary officers in banks after successfully competing with graduates from other streams. Legal journalism which combines law and journalism is yet another exciting vista for young lawyers. Such professionals will be reporting court proceedings of cases that have invoked public interest as also interesting developments in the arena of law at the national as well as international level. Students who have a bend for social work and who do not like joining business law firms or go into court practice can join an NGO working in the field of environment or Human Rights or reputed organizations like CSE, ICRC, UNHCR etc. In a nutshell, LLB course can lead you to a burgeoning career and plenty of job opportunities too. 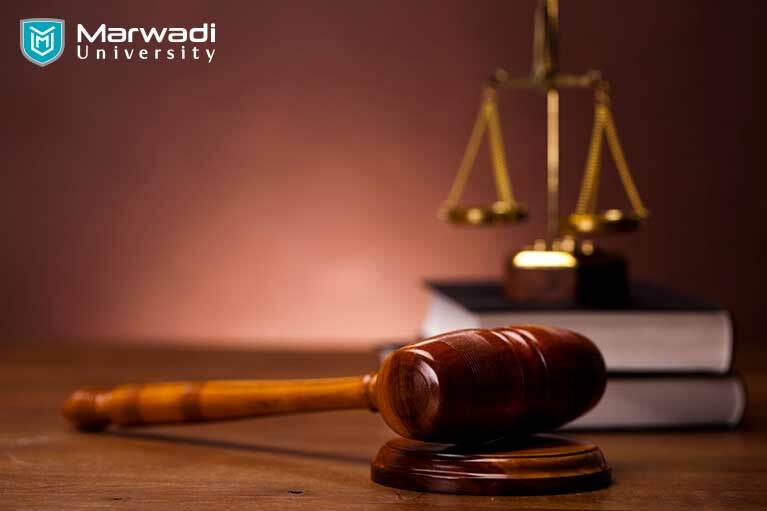 Marwadi University is one of the best law colleges in Rajkot with the highest number of PhD faculties in Gujarat. Admissions 2018 are open, apply now!